It’s not rocket science. As with everything, everywhere, a great web site gives the user what they really want. And it does so in the most engaging way. For a good example of how an international university can give a Brazilian student what they need, have a look at Kings College London. The basics that you expect are covered: news, profiles of existing students, details of visits are all there. You’ll find this kind of information on virtually every university website. 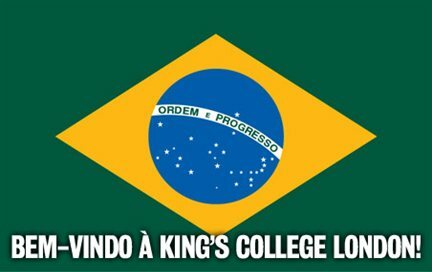 Where Kings College excels is in bringing alive the London community for a Brazilian student. There is a real desire to show off the strong Brazil-London links and the large and active Brazilian community with access to news on sport, religion, events, societies and culture. This all fits in with the ‘soft’ needs of international students, so often ignored by university websites. Potential students are usually young and they (and their parents) need reassurance about wellbeing, accommodation, support, social life and safety. Imagine being in the shoes of a 20-year old Brazilian girl thinking of moving to a strange place halfway around the world – a place they may never have heard of before. And then imagine being their parent. Institutions that recognise the need to communicate accordingly will benefit as a result. It’s always best practice to look at your communications from your audience’s perspective and think about what they want to hear and what matters to them. the university’s Globe news site, offering much greater insight into the story. So, on the website you can learn that Rafael is Brazilian and studies International Communications, but in the linking Globe story you can learn how he has applied his study to set up VibezBrazil, the only specialised Brazil media in Australia. Real, powerful stories help to make Macquarie more attractive to a Brazilian with an eye on Australia. 2012 releases of The Future Index, including Future Brazil, are available at www.thefutureindex.com or drop one of us a line jim.tudor@thefutureink.com, nick.brian@thefutureink.com. stunned why this accident didn’t came about in advance! I bookmarked it.